There's a bit of artistic talent that tends to run in my family, but until 2 years ago I'd never really tried my own hand at much in the art world. Then in Autumn 2014, a friend signed me up for a local painting class as a birthday gift. And, I immediately fell in love with acrylics. I've been painting almost daily (free-hand) ever since! 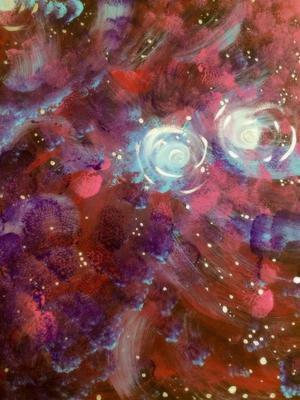 I love painting space themes and galaxies (as well as nature subjects and the macabre)... Nebula!